Channel Silver Eye presents two films by Pittsburgh, PA based artist Alisha B. Wormsley, and Houston, TX based artist Li Harris. In their films, Children of Nan and Cry of the Third Eye, the filmmakers look to the experiences of Black American motherhood, gentrification and notions of abduction and survival. They pull from the genres of science fiction and magical realism to build experimental, multi-dimensional worlds in which to explore these concerns. Alisha Wormsley's film, The Children of Nan, takes place in a dystopic future, where Aditi 34 has only known life underground in a lab where she was created with her three sisters. Their maker, the Scientist, keeps them locked away for their "own safety." Her only connection to the outside world is an archive that gives her insight to how they came to be underground. She and her sisters start to have visions of their mother, NAN and the outside world and even one another in a different life. One by one her sisters begin to disappear and Aditi 34 must escape the lab, go above ground and search through time and space for her sisters and NAN. 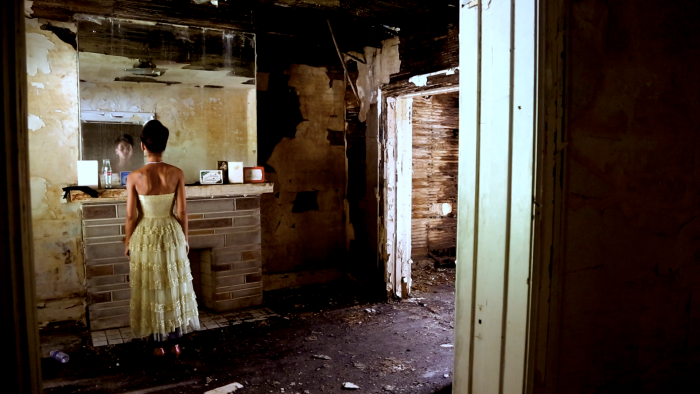 Cry of the Third Eye is a new opera film, that follows the story of a young girl who wonders what’s really going on in the hood as she searches through the redevelopment of historic Third Ward Houston, Texas for her lost dog. This interdisciplinary performance piece touches on identity, gentrification and abduction, and is presented as a semi-silent short film with live musical narration performed by the writer, composer and director, Lisa E. Harris. For more than 20 years, Alisha Wormsley has created video, sculpture, photography and audio works. She is a teaching artist who has worked in communities around the world, helping to develop artistic ideas and celebrate identities, and has organized public art initiatives through national and international residencies. She is the creator of the ongoing “There Are Black People In The Future” project, “Children of NAN,” a film and video archive that serves as a metaphorical survival guide for Black women in America, and “The Space I Am In,” a multimedia collection exploring the mysticism and healing of Black women. Ms. Wormsley is adjunct professor of art at Carnegie Mellon University. And has a MFA in film and video from the Milton Fine Graduate School of the Arts, Bard College. Her two new opera films “Cry of the Third Eye” and “Children of the Lost” use vocal composition and film to amplify the quelled voices of youth and displaced people due to rapid gentrification in Houston’s Third Ward. Harris attained a Bachelor of Music Degree from the Mannes College and a Master of Music Degree from Manhattan School of Music.